HONOLULU (AP) — Hawaiian Holdings Inc., the parent company of Hawaiian Airlines Inc., said its third-quarter earnings slipped on higher fuel costs, but noted passenger demand remains strong. The company earned $25.6 million, or 50 cents per share, compared with $30.5 million, or 59 cents per share, a year earlier. Adjusted to exclude fuel costs plus the amount it spent on hedging those costs, net income was $30 million, or 59 cents per share, compared with $28.5 million, or 55 cents per share a year ago. Hawaiian Air reported last night. They have done good. JBLU will be reporting later, and if HA are any indication, report reasonable numbers. Currently, along with the rest of the market, JBLU are trading lower. While I don’t hold this specific stock, I do hold HA & JBLU which are benefiting from any industry based outlook improvement. AMR Corp.’s American Airlines reported a 1.3% traffic gain in June, again driven by international demand as the carrier’s strategy of adding more capacity for travel abroad yields dividends. Airlines won the backing of a U.S.- based technical-standards group to power their planes with a blend of traditional fuel and biofuel from inedible plants, the Air Transport Association said today. Fuel processed from organic waste or non-food materials, such as algae or wood chips, may comprise as much as 50 percent of the total fuel burned to power passenger flights, ATA spokesman Steve Lott and a Boeing Co. (BA) official told Bloomberg. Other biofuels companies that may benefit from opening up the $139 billion-a-year aviation fuel market are Neste Oil Oyj (NES1V) of Finland, Spain’s Abengoa SA and Honeywell International Inc. (HON)’s UOP unit, which is developing a fuel-making technology. Officials from Neste, Abengoa weren’t available for comment. The decision to amend jet fuel specifications to include fuels from bio-derived sources “is a tremendous accomplishment for aviation and the result of tremendous collaboration across the entire industry,” Boeing Vice President of Environment and Aviation Policy Billy Glover told Bloomberg News in an e-mail. “Developing a renewable fuel supply is a critical part of our industry’s strategy for achieving carbon-neutral growth beyond 2020 and creating a sustainable future for aviation and the global community it serves,” Glover said. The preliminary approval was granted this week by the West Conshohocken, Pennsylvania-based ASTM International, and it may allow Airbus SAS and Deutsche Lufthansa AG (LHA) to undertake a six- month trial they plan to start in the coming weeks using one engine powered 50 percent by biofuel from jatropha, camelina and animal waste. Final approval will happen on July 1 at the earliest, Barbara Schindler, communications director at ASTM, said today by phone. Airlines will then be able to begin using bio-derived fuel a week or so thereafter, she said. Under their Burnfair project, Airbus and Lufthansa plan to fly using so-called hydrotreated renewable jet fuel every day, four times a day, from Hamburg to Frankfurt. Lufthansa is aiming to blend clean fuel with kerosene at up to 10 percent of the total by 2020. Airbus estimates airlines may consume 30 percent of their fuel from plant-derived sources by 2030. The 27-nation European Union is prodding airlines toward cleaner fuels by forcing them to cap emissions or buy permits for the excess beginning next year. Aviation accounts for about 2 percent of global carbon-dioxide emissions. General Electric Co., the world’s biggest jet engine maker by sales last year, said at a 50 percent blend level it doesn’t expect to see any impact on engines or operability. Airbus and Boeing, which together manufacture about 80 percent of the world’s passenger planes, are planning to set up biofuel production chains across the world. Airbus is working on a supply hub in India where it’s talking with government and airline officials. Its aim is to form joint ventures and partnerships with growers, transporters and refiners. Boeing is negotiating with companies across the supply chain in South America. Fuel from inedible plants or waste doesn´t put price pressure on crops as can fuel from corn, sugar cane or soy. Honeywell and Indian Oil Corp., the nation’s largest refiner, are planning to establish a pilot biofuel production plant in India next year, James Rekoske, vice president of renewable energy at Honeywell’s UOP, said. It would be Honeywell’s first pilot facility in Asia and the companies will examine the feasibility of using plants such as jatropha and pongamia to make renewable jet fuel. “This will be a tens of millions of dollars investment made by the time we’re done,” Rekoske said. It’s more expensive to produce diesel from biomass than from crude oil, he said, estimating the difference at less than $2 a barrel. First for the industry in general. 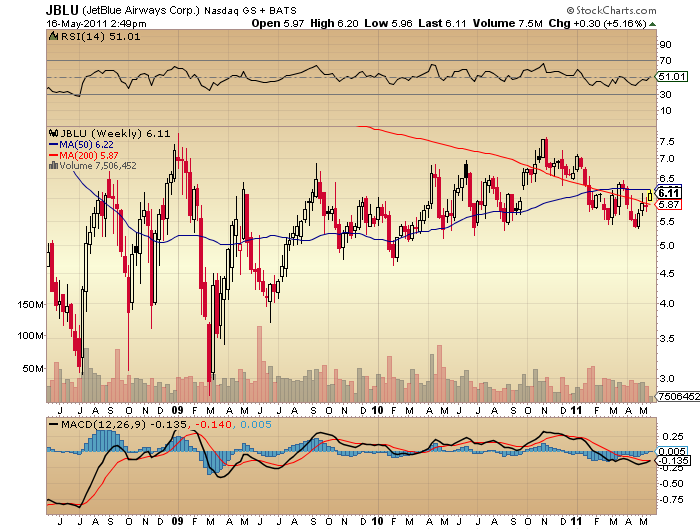 The airlines as a group have underperformed stocks, largely due to headwinds with oil and jet fuel. If oil prices stabilise, or even fall, then airlines could well outperform as ticket prices can fall, thus stimulating increased demand. NEW YORK (AP) — To fly someone from New York to Los Angeles and back, airlines spend close to $330 these days — just on fuel. That’s a 48 percent increase from last year and the main reason vacationers face record costs to fly this summer. To offset their single biggest expense, airlines have hiked fares seven times this year and raised fees for checking bags and other services. This has only added to the frustration of most casual fliers who see $59 fares advertised but are quoted prices well above $300 when they actually try to book. Americans’ expectations of a cheap vacation are being destroyed by the reality of $100-a-barrel oil. “The passenger has to understand that the airline industry in the United States is not meant to be a low-cost mass transit system. The airlines are in business to be profitable,” says airline analyst Robert Herbst. A decade ago, fuel accounted for about 15 percent of airline operating expenses. Five years ago, it was 29 percent. Today, it’s 35 percent. During the first three months of 2011, the airlines spent $8.7 billion on fuel, 31 percent more than last year. In the current quarter, jet fuel expenses are even higher. U.S. airlines burn an average of 22 gallons of fuel for every 1,000 miles each passenger flies. At $3.03 a gallon, airlines are currently spending $330 per passenger just on fuel for a 4,950-mile transcontinental round-trip. Some fliers might have paid less than that for their ticket while others could have spent more than $2,000. — Salaries and benefits account for 28 percent. Ten years ago, it was the biggest expense at 39 percent. But several major airlines filed for bankruptcy and that allowed them to renegotiate labor contracts. — Aircraft maintenance, airport landing fees and travel agency commissions account for 18 percent. — Aircraft lease payments, food and drinks and in-flight entertainment account for 5 percent. And that’s even with most airlines no longer serving peanuts. — Another 14 percent goes to miscellaneous costs, such as updating reservation systems and marketing partnerships with other airlines. The price of a domestic round-trip ticket this summer is forecast to be $430, on average. That includes taxes but excludes baggage fees and other services. While airfares should break nominal records, they are not nearly as high as they were a generation ago once inflation is factored in. The average ticket in 1978, the year airlines were deregulated, was almost $650 in today’s dollars. Deregulation created more competition, which ultimately drove down prices for passengers. With oil close to $100 a barrel, fuel has become the expense that preoccupies airline executives more than any other. It is the reason airlines started charging for checked baggage in 2008 and why they have raised fares more than 10 percent this year. Baggage fees — typically $50 per bag, round-trip — have added more to the cost of flying since 2008 than fare increases have. Despite the rising fares and fees, demand for air travel is rising. The airlines expect 206 million passengers this summer, a 1.5 percent increase from last year, according to the Air Transport Association. That suggests airfares aren’t likely to decline soon, despite a drop in oil prices this month. The airlines lost a combined $1 billion during the first quarter and hope to recoup that with higher ticket prices. Could go anywhere really. Anyhow, I continue to hold.